"McKellen excels as a vulnerable, flawed version of the English detective"
Sherlock Holmes is one of the most enduring characters in fiction, appearing in books, movies, plays and many other forms of media. There have been many interpretations and revisionist takes of the character, including the adaptation of Mitch Cullin's A Slight Trick of the Mind by Bill Condon. In 1947 Sherlock Holmes (Ian McKellen) is a 93-year-old man who has just returned from Japan to his home in rural England. His only company are his housekeeper Mrs. Monroe (Laura Linney) and her very bright son Roger (Milo Parker). With his memory and health failing the elderly Mr. Holmes tries to remember his last case as a detective 35-years-old ago: the case that made him quit the business. As he does this, he also reflects on his recent trip in Japan and befriends Roger. 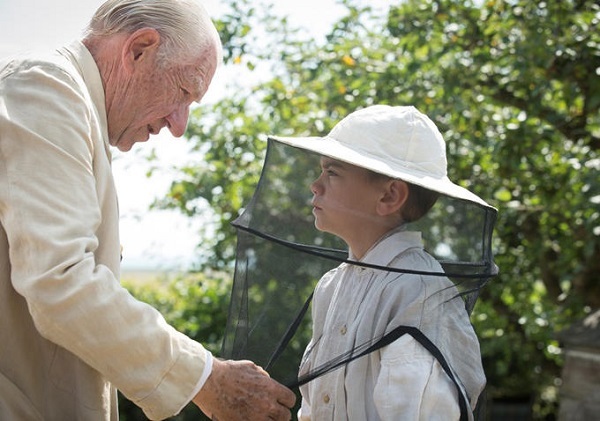 Since Mr Holmes was premiered at the 2015 Berlin International Film Festival it was met with critical praise, deservingly so because it is a multi layered drama. It is a story that focuses on a number of themes which include aging and memory, guilt, the irrationality of human behaviour in the face of logic and characters looking to challenge themselves when the people around them are beneath them. Mr Holmes does work as a Sherlock Holmes story as he reflects on his life and a broader drama about an aging man in solitude. Sherlock Holmes is a character that has seen many iterations and seeing an older Holmes is an interesting new take. This version of Holmes shows a much lonelier figure; characters like Dr. Watson and their housekeeper Mrs. Hudson are kept at a distance, with Holmes having to work alone on his final case. We still get to see some of the characteristics we know about him: his intelligence, his innovation and his wit, resulting with Mrs. Monroe being on the receiving end of snide comments. Holmes' powers of deduction and observation and his abilities for academic and scientific research are present. But this Holmes is fallible, making mistakes and succumbing to faults all people can suffer. After two critical duds (The Twilight Saga: Breaking Dawn and The Fifth Estate) director Bill Condon returns to material he is much more comfortable with and reunites with his Academy Award nominated Gods and Monsters actor. Condon and his regular cinematographer Tobias A. Schiessler make a brightly lit movie, highlighting the summer environment of the south coast of England and the whole production team make a very regal movie with its period details. The mystery that Mr. Holmes solves in 1912 is fairly simple by the standards of the series, but the mystery is not the main focus. However the scenes in Japan are clearly not shot in Japan. McKellen is a great actor on the stage and screen, whether in Shakespeare adaptations or playing Magneto and Gandalf. He gives another fantastic performance, playing a revisionist Holmes who is still intelligent, but also a flawed man. Holmes is a man ruled by logic and cold, hard analysis, making him isolated as he battles the physical and mental effects of aging. He struggles to understand human emotions, which ironically makes a more human character. Despite Holmes' intelligence, he lacks knowledge of the nuances of human behaviour and it is debateable on whether Holmes' lack of memory is due to his age or if he is suppressing it and needs objects to trigger it. One of the key aspects of Mr Holmes is the relationship between Holmes and Roger. For Holmes, Roger is an intelligent boy he can mentor and test. Meanwhile, Roger gets a father figure to replace the man he lost during the war and enables the boy to follow intelligential pursuits. McKellen and Parker have an excellent rapport together as they question each other and grow closer. The other key relationship is between Roger and his mother. Mrs Monroe is struggling to be a single mother and having to care for the ailing Holmes as he embarks on scientific research and stubborn refusal for help. But Laura Linney seems to use the role to experiment with regional accents of the British Isles, coming up with a combination of West Country, Welsh and Irish. 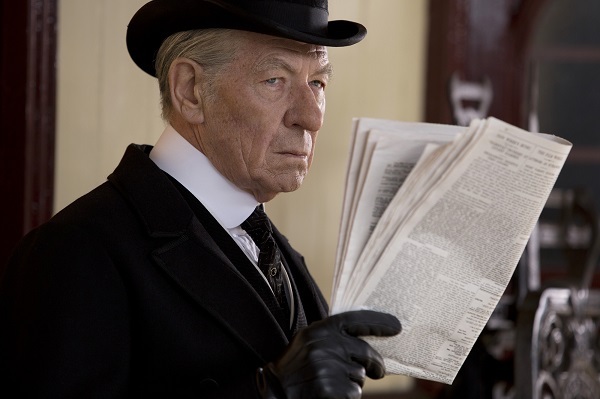 As well as McKellen, Linney and Parker, Mr Holmes does boast a fine supporting cast, having veteran Japanese actor Hiroyuki Sanada and Hattie Morahan as the subject of Holmes' investigation. Other actors like Phil Davis and Frances de la Tour appearing in one scene and still have prominent billing. De la Tour was meant to play a German character, but sounds stereotypical Eastern European/Russian as the glass harmonica instructor. Fans of the legendary detective will this enjoy this interpretation of Sherlock Holmes as an older man, battling more human issues as well as being the intelligent character we know him as. 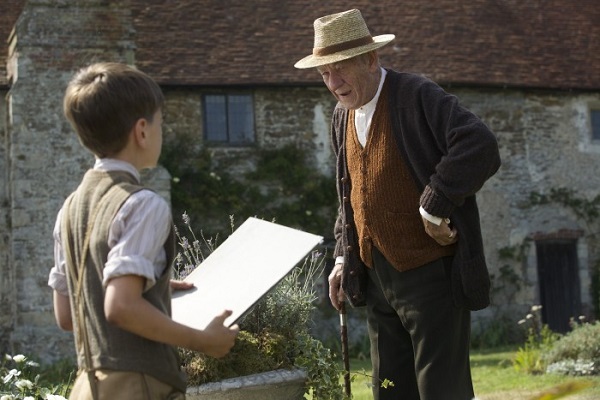 McKellen excels as he brings out the humanity of Mr Holmes and making him a more flawed, relatable character.